Jon Sands and Chris Jordan have brought together a group of artists, collaborating on creating an evening of animated mixed media poetry performance for Boston’s first Nuit Blanch, Illuminus. 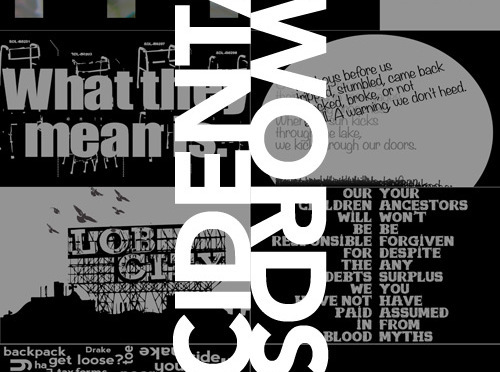 The project, titled, “Incidental Words”, is a roving performance of poetry by three of the East Coasts most relevant spoken word artists: Jon Sands, José Olivarez, and Simone Beaubien. During the readings, animations created by Jamie Leo and Chris Jordan will be projected in real-time, giving a new dimensionality and visual life to the spoken word. A 300lb RC controlled robot by Glen Duncan (Spec) serves as a platform for the equipment, including projector, computer, sound system and batteries. Music by Ajda the Turkish Queen. The group will move around the festival, projecting and performing Incidental Words throughout the event.